If you’re a potential builder/owner then this post will interest you. I went searching today for free house plans… our sawhorses, workbenches and router tables were such a big hit ;) There’s not too much out there in the way of totally free plans. 6 that I could find anyways. Free for a limited time (until November 1st). 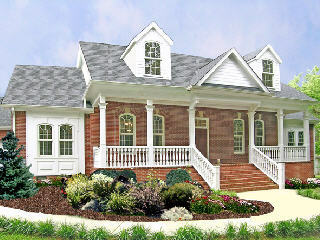 Designed by Jerold Axelrod, the Delafield is a formal yet gracious country ranch house plan. This balanced, formal plan offers a tall covered porch flanked by beautifully trimmed flat bay windows. 2 bedrooms, 1 bath starter home PDF file with 9 sheets printable to 24″ x 36″ paper. Designed to 2006 International Residential Building Code (IRC) and 120 mph wind codes, this plan is permit-ready. This unbelievable resource comes from Justin in the comments. I’m going to poke around on other college sites and see if I can’t rustle up some more free plans! 1) Plans range in age from 1933 to 1988… these are NOT new, stylish home plans. The older homes are designed with coal heat in mind. 2) Downloading PDFs is free. 18 x 24 inch (blueprint-size) plans are $4.00 per page. 3) Not all plans are actually for houses (I realized this after counting…). Some are for garages, some stairs, some for decks. Mostly they are houses though. Do you know of any other free house plans out there? I mean totally, no strings free too ;) Let me know. Thanks for posting our Laura plan! We also offer our Becky plan as well as the framing cut list drawings with it (a $1,675 value) for joining our mailing list. The weekly newsletter shows our plans on sale that week at drastically reduced prices as well as secret sales (plans that are less than $50!) for our newsletter subscribers. You’re welcome – you’re in an elite minority of sites that offer free house plans. Thanks for keeping it free – I think it’s a great way to help fuel the spirit of potential owner/builders. Um… Justin… you just handed over an astounding resource… THANK YOU! Now I have to change the title of this post from 6 free house plans to… 600?? Thank you very much. Saves lots of time and really of great use. For those interested, check out this website. It provides many FREE and COMPLETE house plan. You have the plans in pdf format and dwg as well where you can modify it in AUTOCAD software. Really of great use. Check freegreen.com. They have recently added some new plans. Check out http://www.thehouseplansite.com for a free contemporary house plan. I found a great site (www.freegreen.com) that I linked to in my name (above) that offers free green home plans as well. They have some nice designs on their website, as well as a substantial list of green products. You guys should check them out. We are now offering free house plans also, with a small processing fee to personalize the plans and add them to a Plan Center the client can access to view, print and email.